Riding a motorcycle is always an adventure ­– at least when compared to the tame comforts offered by a sedan. However, November rains and spring downpours alike can add a life-threatening edge to this adventure for urban and rural riders alike. The way we see it, there is no need to jeopardize future journeys by taking tires to its ultimate extreme. This is especially true now that a wider variety of super rain tires have been designed and marketed for motorcycles. Finding a pair of wheels with enough traction to meet a puddled curve straight on used to require days of searching and negotiating across specialized auto shops and mechanics. Now, the internet places many high-quality options directly at your doorstep for all types of bikes and budgets. We have scoured, tested, and acquired a few bruises to select the best that today’s market has to offer. The models listed below are all brand new, from top-ranked specialized tire makers, and are compatible with two-liners and rugged all-terrain choppers alike. We have strived to offer something for all budgets, but we should nonetheless stress that quality rubber does not come cheap, and in the case of motorcycle rain tires, it is an investment that may save your life. Michelin is probably the biggest name in the world when it comes to tires, and they have earned this reputation through decades of conscientious engineering and supreme material durability. The Pilot Road 4’s thread pattern looks simple at first glance, but it is actually one of the most effective designs at pushing water that you’ll find. The tire itself is made from reinforced dual-structure rubber, which can double the tire’s durability if properly maintained. Both the standard finish and the GT version, which has a stiffer casing, also provide good stability. They allow any experienced rider to bend and perform precise maneuvers on the fly quickly. Designed with heavy loads in mind, a set of Michelin Pilot Road 4s will work equally well whether you are riding solo, with a partner, or even with luggage. Dunlop has always placed its connection with the American entrepreneurial spirit at the heart of its branding. This philosophy never feels truer than with their American Elite tire series. They are made with the highest-graded multi-thread rubber that Dunlop can offer. The pioneering, resilient quality of these tires is clearly visible on every angle of its thread and casing, as well as in the unapologetic sturdy balance provided by their radial axis. They were also designed with loyalists in mind, and are, therefore, a great option if you don’t like to keep track of different models for each season. Despite its durability and traction, these tires work just as well in rain and dry conditions. Urban riders can also enjoy their impressive cornering performance. Versatility is a great asset for any motorcycle tire, but if you are planning an off-road expedition into a wet or permanently rainy region, then your best bet will be to head straight for a specialized product. Metzeler is a German maker of motorcycle gear and accessories with a strong focus on adventuring and extreme experiences. Their Tourance EXP tires would be turning heads on any city or suburb, but in their natural habitat – which is, of course, the fastest highway in the world – the cleverness behind their design becomes immediately evident. Ideal for light bikes at high speed or in irregular conditions, a set of Tourance EXP will keep you smooth and stable through wet pavement and gravel alike. The motorcycle scene has greatly expanded over the past 10 years, thanks to an entire new generation of traffic dodgers and an increased awareness of the effects of high mileage on our monthly budgets. However, not everybody is jumping on a tiny scooter. Many of us still prefer the good old traditional models or are simply not ready to upgrade. For them, a set of Continental Ultra rain tires can improve the maneuverability and stability that is often sacrificed when sticking to an old model. In addition to minimizing aquaplaning, these tires are V rated at speeds of 149 miles per hour, but their performance can increase to a full-on H rating if you keep the needle under 130. Trying to drive a sports bike in the city while staying on the right side of the law always requires some degree of negotiation, both when choosing accessories and when setting your speed. However, the Pirelli Angel GT tires go a long way in eliminating any residual feelings of FOMO. These tires remain fully street-legal but remain safe and stable for any straight-wheeled bike that needs to cruise on wet pavement. Going for a fast ride or meeting an unexpected turn are never ideal ways to drive in the city, but these tires will make them as safe as they could possibly be. The tire itself is made from Pirelli’s standard bi-compound material. As an added bonus, these tires are reinforced with a longitudinal steel belt, which will keep them shapely and cool even if the asphalt starts fuming. From its daring name to its rugged design, a set of Continental Road Attack tires is meant to instill confidence in your own courage and your riding skill alike. If you are a sports bike lover who can’t predict if the day will stay wet or suddenly turn hot and dry, these tires will provide you the adaptability you need to keep riding on. The combination of a multi-layered thread and an extra-resistant composite rubber provide increased grip and durability. Add an efficient mono-spiral belt design, and you end up with a high-performance set of tires that will keep any slim linear motorbike maneuverable and stable. 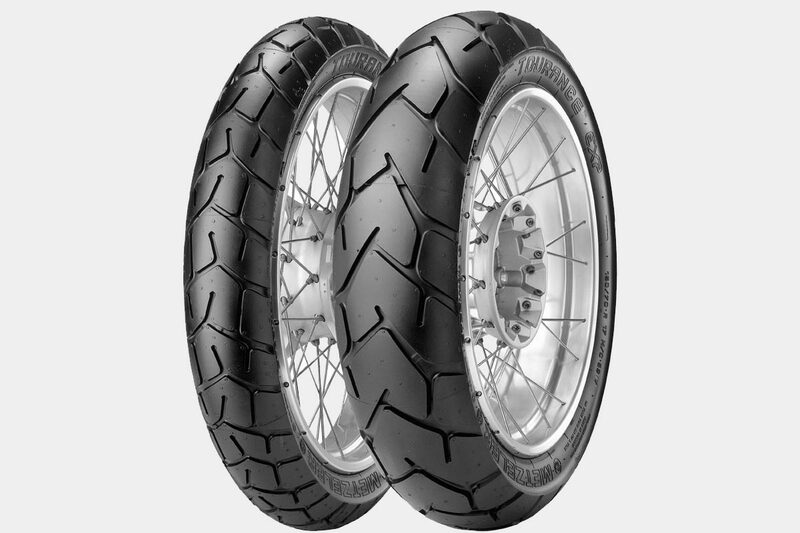 Superior precision and an exciting, completely revamped thread pattern make the Battlax Sport Touring tire set a significant investment for both safety and style. For the materials, Bridgestone chose to go high-tech and renew their blend’s composition as well. The result is a remarkably light and flexible tire that still offers up to 20% more durability than the industry average, as well as a lasting and reactive grip whenever facing dry pavement or gravel. The threading itself is deep and won’t wear down as quickly, preventing aquaplaning (or its deadly consequences) longer. This tire set comes in five available sizes, which means it is compatible with an even wider range of models. All entries on this list have improved threads to ensure they are rain-worthy. However, the Michelin Power Rain takes this ambition one step further, openly advertising its capabilities on its name. The sharply increased grip and deep “fountain” thread pattern provide the highest amount of precision so far, although they do this at the expense of versatility. This tire set was meant for water, mud pools, and swampy conditions. It performs beautifully the day after a storm, but will need to the changed before summer comes – deep threads tend to resist heat poorly. Nonetheless, if you are planning a lengthy road trip during the autumn or you live in a very humid area, these tires will more than pay for themselves. There is always a price to pay for quality, but in the case of the Power Rains, it’s very easy to see where the extra money is going. Although we all love the circuit experience, many people see motorbikes as their full-time replacement for boring four-wheeled cars. If you are a heavy duty driver or like to bring a passenger along, then the main priority for you is ensuring your gear and accessories can handle the extra weight. Your rain tires should then keep your rear end bouncy and straight without accidentally skidding or tossing you to the ground on the next freeway exit. Deep and durable threads are not often seen on thick rear tires – they tend to be reserved for sports models, after all. If this conundrum sounds familiar, then the Bridgestone Exedras are an option worth exploring. They provide long mileage and great water evacuation, which is only improved if you upgrade to the tubeless closeout version. A common objection to imported tires and European brands is that American roads are simply different – and anybody who has been involved in highway construction and design can confirm this. These differences are especially noticeable for those who like custom touring motorbikes or are fond of long road trips. The differences in asphalt grade and terrain will be most noticeable on secondary roads and away from cities. Metzeler knows this too and has designed their Marathon Ultra line with the needs of their American fans in mind. These tires remain stable at both low and high speeds, and their tubeless construction has been reinforced with parabolic gauges that drain more water and extend mileage far beyond the industry average.